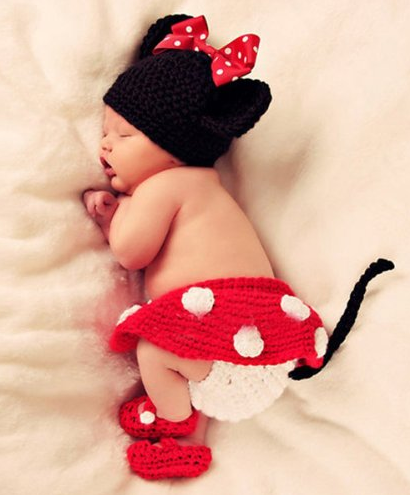 "Minnie Mouse" Style Crocheted Baby Costume Only $9.99 PLUS FREE Shipping! You are here: Home / Great Deals / Amazon Deals / “Minnie Mouse” Style Crocheted Baby Costume Only $9.99 PLUS FREE Shipping! “Minnie Mouse” Style Crocheted Baby Costume Only $9.99 PLUS FREE Shipping! Disney fans, this is a hot deal for you! Wouldn’t your little one look cut in this “Minnie Mouse” Style Crocheted Baby Costume that is Only $9.99 PLUS FREE Shipping!? It comes with a hat, skirt, diaper cover and shoes and it is sure cute for baby portraits! Get yours NOW!